Sometime back my friend asked me to post some recipe as she is new to cooking eggs. Ever since i have been thinking of posting something for her to try. Then few days back a friend came over at a weekend evening and i cooked up this egg curry. i remember a very simple version of my moms egg curry and used it as an inspiration for this slightly fancy version. I have used some whole spices in the recipe but this curry can be prepared without them too and i'm sure will be equally tasty. 1. Heat oil and add whole spices and cook for 2 minutes. 2. Add ginger garlic paste and cook for a minute. 3. Add onion paste and cook till golden. 4. Add turmeric, chili,coriander pw and cook for a minute. 5. Add tomato paste and cook till oil separates. 6. Prick few times all over peeled egg with a knife . 7. Drop them into the gravy and add 1/2 cup of water. 8. Add salt to the gravy and cover and simmer for 5 minutes. Nisha ...thanks a lot for posting this recipe. This will really help me to cook egg curry . Mutta curry makes me drool, looks so spicy and delectable!!! 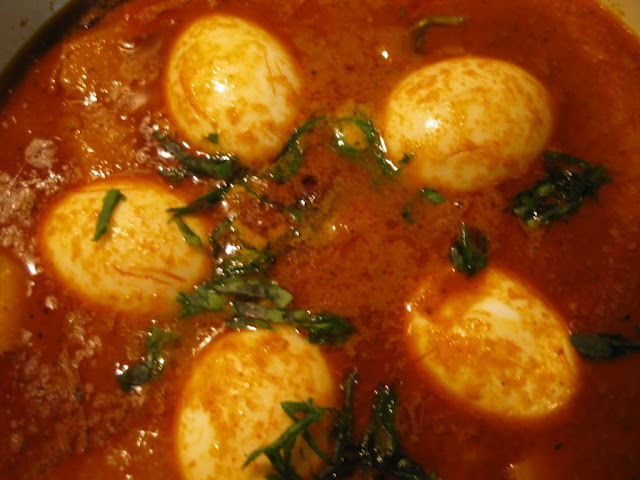 Super egg curry..Looks awesome..Love to have it now with some Appam.. I tried this today..as a side dish for chappathi and it turned out too good. Adding a tsp of Lemon juice at the end, added an extra sharp taste to the curry.